If you have discovered Bed bugs don’t worry, you're not alone. Far from it. We get many calls every day concerning this fast growing problem. Getting rid of Bed Bugs is not always easy and there are only a limited number of options. Ignoring a Bed Bug problem is not a good idea because it will not go away or fix itself and for certain, it will only get worse. If you decide to thumb through Yellow Pages and hire the services of a pest control company, it can sometimes be exceedingly expensive with some UK "professional" or "specialist" companies charging eye-watering hourly rates of £150+ per hour. And if you ask them if they guarantee to solve your Bed Bug problem, you might get a simple "no", or an evasive answer or an awkward silence. To put the prices some of these companies charge into perspective, based on a 40 hour working week, your family Doctor gets paid around £40 per hour. A heart surgeon when working for the NHS in 2011 earned an average salary of £60 per hour (£120,000 per year). However, if your Bed Bugs have become well established, the infestation can reach the point where it's simply too serious tackle yourself and you will have no choice but to bite the bullet and bring in a pest control company. There are some good ones out there that won't cost you an arm and leg. As with all things, get two or three quotes. Check the hourly rate. Ask how many hours they will take. Ask if the price includes VAT. And ask what happens if you find Bed Bugs a week later - do they charge for a return visit. And ask for references from their customers with phone numbers and follow them up. But if the problem is not too serious, you can follow our simple plan & guidelines and you should be able to get rid of bed bugs and have things under control. Depending how established the bed bug infestation is, it's not always solved instantly and in some cases, it can take several treatments before bed bugs eradicated. The one thing I can’t emphasize enough is a clean mattress. Bed Bugs love mattresses. 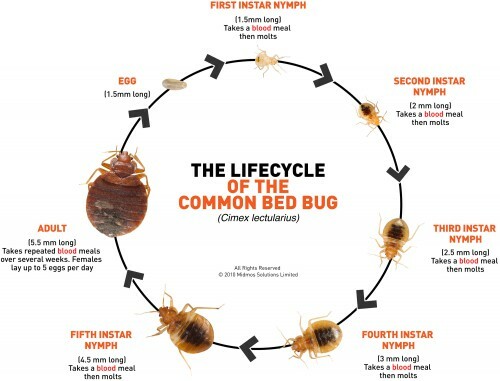 To a Bed Bug, a mattress is a fast food take-away, with humans providing the source of food - our blood! It's the perfect home being warm, dry and with plenty of food around. Best of all, a warm human to curl with and bite at night. It couldn’t get any better for them. One way to protect your mattress and break the life cycle of a bed bug is to purchase a mattress encasement. 1). Chose a day when you can treat the affected room(s) in one go. 2). Remove all the bedding down to the bare mattress and if you can, lean it against the bedroom wall. Wash the bedding on the hottest wash it will take. Clear the floor area and start by giving the room a good vacuuming. 3). Light one of our Bed Bug smoke bombs, close the doors and windows and leave for about 1- 2 hours. Open the windows, let the fumes escape then vacuum again. Clean around the edges of the carpet where it meets the skirting board. 4). Spray the bed frame with one of our Bud Bug Killer sprays. 5). And now the VERY important step. Encase the mattress in one of our Mattress Protector Covers. This will stop any of the eggs that will have been laid previously, from hatching in the coming weeks and getting out of the mattress. They will be 100% encased / trapped and cannot get out at all. If you don’t do this, the problem will only come back in weeks to come. 6). In the following days and weeks, keep giving the room a good vacuum cleaning. If you have more than one room infected, do both together. If you don’t, by simply walking from your 'infected room' to your newly clean bedroom can start the whole bed bug cycle again.